**** This item ships free in the continental United States! 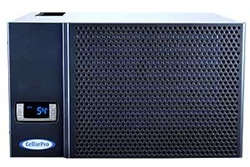 CellarPro 1800 provides outstanding performance, adjustable humidity control and quiet operation. Designed for small wine cellars and residential wine cabinets that are located in a temperature-controlled environment. 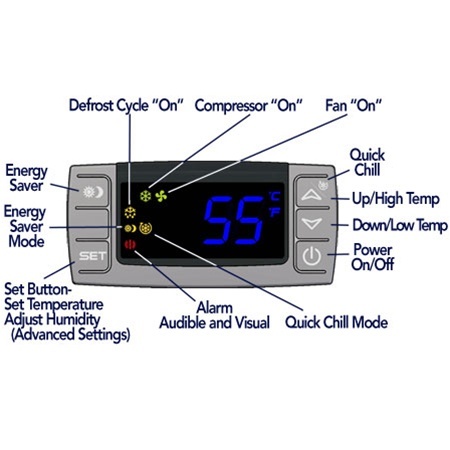 Electronic thermostat with digital LED display and adjustable humidity control. Click Here to view control panel. Interchangeable Top Vent/Back vent exhaust, see Vent. Removable steel case, cord exits from the rear for 115 amps outlet and 3-Amp light receptacle. Click Here to view. CellarPro 1800QTL for quietest operation to handle up to 80 cubic footage* designed for small wine cellars and residential wine cabinets that are located in a temperature-controlled environment. Can be used to replace Breezaire 1060 and Wine-Mate 1500 cooling units. CellarPro 1800QT for quiet operation to handle up to 200 cubic footage* designed for small wine cellars and residential wine cabinets that are located in a temperature-controlled environment. Can be used to replace Breezaire 1060 and Wine-Mate 1500 cooling units. CellarPro 1800XT for extra power to handle up to 250 cubic footage* properly insulated and sealed wine cabinet/cellar. Recommended for small wine cellars and larger wine cabinets that are located in warmer environments and/or used by commercial establishments - but with compromise for fan noise. Can be used to replace Breezaire 2200 and Wine-Mate 2500 cooling units. CellarPro 1800XTS (interior) & XTSx* (exterior) for more extra power to handle up to 400 cubic footage* properly insulated and sealed wine cabinet/cellar. Recommended for small wine cellars and larger wine cabinets that are located in warmer environments and/or used by commercial establishments - but with compromise for fan noise. Can be used to replace Breezaire 2200 and Wine-Mate 2500 cooling units. Cellarpro 1800XT-220V and 1800 XTx-220V designed for 208-230V, 50-60Hz environments with wine cabinets and wine cellars at R-19. Power Cord Modification - the 8-foot, 16-gauge grounded power cord can be routed to exit from the left side of the cooling unit, just below the power outlet. This modification is designed for cooling unit installations where the power outlet is located inside the cellar. Click Here to view. 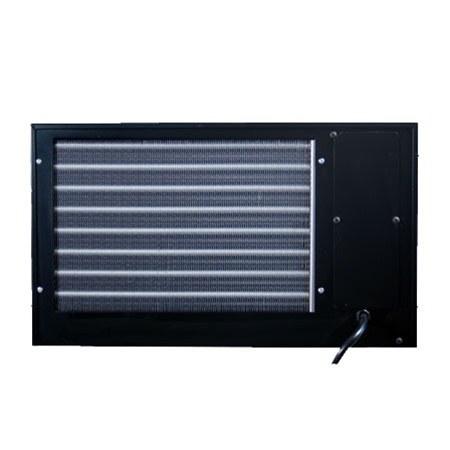 Air Filter & Frame - Our poly-coated filter and aluminum filter frame are designed to fit snugly over the condenser coils on the CellarPro 1800 cooling units. The frame has magnets to hold the filter snugly in place, thereby trapping dust and particles before they gum up the condenser coils. Clean coils and filters ensure that the cooling units operate at peak performance. Mounting Clips - Designed for bolting wine cooling units to the ceiling inside a wine cellar. Two mounting clips can attach anywhere along the front of CellarPro cooling units and offer predrilled slots for bolting to the ceiling of the wine cellar. Compatible with CellarPro 1800 and Breezaire WKC/WKCE models. A condensate fitting is recommended when the cooling unit will be installed in a wine cellar. The fitting allows excess condensation to drain from the rear of the cooling unit through the vinyl tube. The included tubing measures 8' long with a 1/2" I.D. Click Here to view.